Download this chief accountant email database now and get the quality sales leads you need to promote your accounting products or services to vice presidents companies and institutions within a few minutes. Vice presidents of accounting are counting on you! 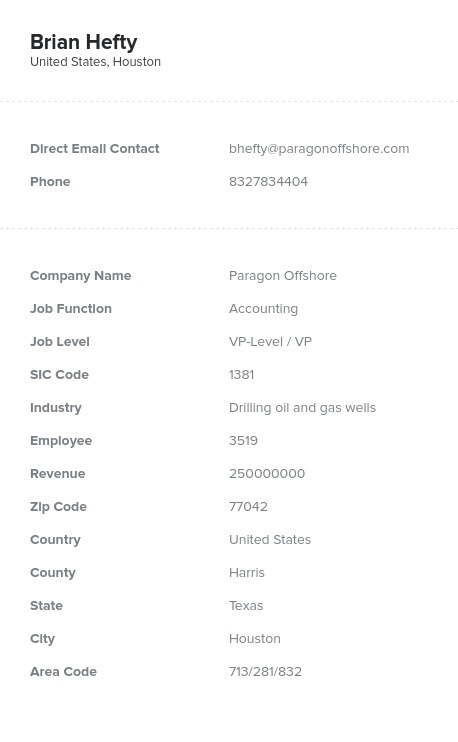 Chief accounting officers' email addresses, phone numbers, real names, and postal addresses are all packed inside this one organized and human-verified business contact database, which is culled by job title. Find powerful c-level and senior accountants with high-level titles like "vice president of accounting" or "chief of accounting." Our email list of VPs of accounting can be downloaded and used within minutes so that you can start networking, building more effective ties with accounting departments, and make more sales. Whether you're showing off a new accounting program, tax app, budgeting tool, or even outsourcing service, this chief accountant mailing list is the best way to get the right sales and email leads to start that conversation. An accounting vice president would be the person to talk to if you're hoping a company will make sweeping changes or a large B2B purchase due to their high level of influence over their department and institution. This is a very important set of contacts for your sales team to have, and you can download this VP of accounting mailing list right now. Give the budgeting and tax experts a break with this email list of chief accountants! Show off your services or products to those managing accountants with our chief accounting officers and VPs list today.